Do we still need the Electoral College? let's talk about your politicians for a minute ... do you LIKE them? If this thread were about our politicians I'd definitely point out what I don't like about them but it's not. Unfortunately, yes, the anti-establishment movement has put him there. I'd never want my children to look up to him as a person, and I certainly never will. I'd be worried if he was our leader. [QUOTE="Tsalagi, post: 4964482]So do many millionaires. There all sorts of learning experiences along the road of life! So do many parents from all walks of life. [QUOTE="Mimi, post: 4964032]America can't be better when it's lead by a male that speaks/thinks the way Trump does about women. Not a chance. Regardless of whether it was dug up or not, it's true. Does this mean that Jokaroo can't be better when it is full of sexist posters, both male and female? The Electoral College meets in 9 days to confirm Donald Trump as the next President. [QUOTE="Goodgrief, post: 4963953] Just my two cents worth to you, U.S citizens. Don't ever let go of your electoral system. Yours is a fair way of voting for what is good for you or what will work for you. We, Canadians, are forced to vote for a party to elect the Prime Minister. But there's the clincher. The most populated provinces are the ones who sway the election. Most likely the ones who benefit the most from equalization transfers from less populated, but most productive provinces. Never let go of the electoral college! brilliant how they set that up. It gives the entire population a voice...vs bigger cities who could harm rural areas because their issues and needs are not the same. It was set up to keep tyrants from taking over. A politician would only need to bend to the cities and make the whole voiceless. Here is my deal. Anyone of you who wants to move up here, gimme a shout. I will gladly trade my place for yours. He was a big mistake - we saw coming. And this shows a fundamental misunderstanding of Democracy. If you feel this should be the way things are sorted out then what you are saying is that Land Ownership should be the basis of government. What you have may work, but it isn't a true democracy. It is at bewst a form of representational democracy but then you have very unequal voting power. 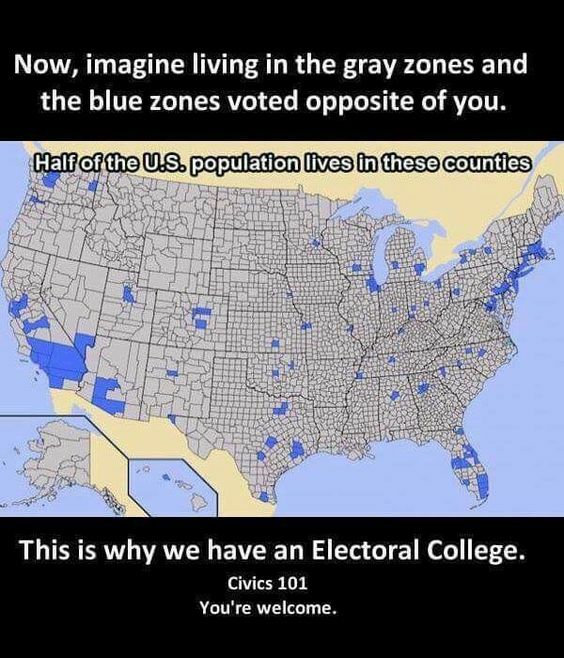 if we got rid of the electoral college, you might as well get rid of the 2 party system, and elections, because those 2 states would decide the outcome of every single election! So what you are saying it that not everyone is equal? It is not the fault of those states that more people want to live there. are you saying the farmer in Iowa doesn't count as much as the flat owner in New York City? No, I'm saying they should count the same but I believe the electoral college makes a difference of a factor of three in the value of some votes. So you canot claim to e a democracy, more of a Autocracy where the "state" has the power. Moreseriously, I can understand why this might be, but in accepting it, you have to recognise the unfairness of the model. AS long as their are means of change though, I can live with it.